Some people are put on this earth to inspire us in *what* to do. Others are here to inspire us in what *not* to do. If in the world of Middle Earth, Aragorn was the former, than poor Boromir was the later. What happens when you allow greed, envy and a lust for power cloud your judgment? When you rationalize your behavior as necessary to meet some greater good? You end up losing the trust and loyalty of those around. But hey, take a few arrows in the chest for your friends, and you can win them (and us) back again. 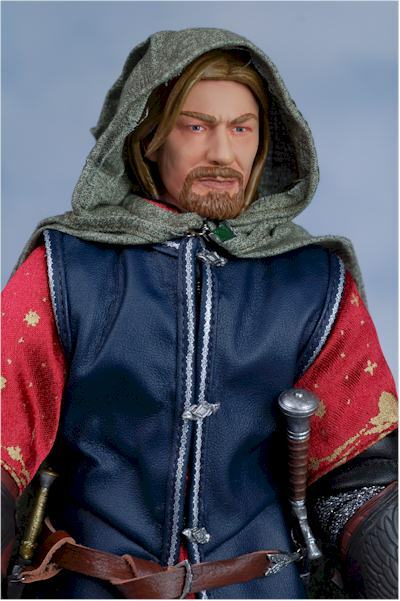 For the third release in Sideshow's sixth scale Lord of the Rings line, they went with brash and rash Boromir. The last of the Fellowship that looks like a Chippendale dancer, they'll be moving on to his brother Faramir next. 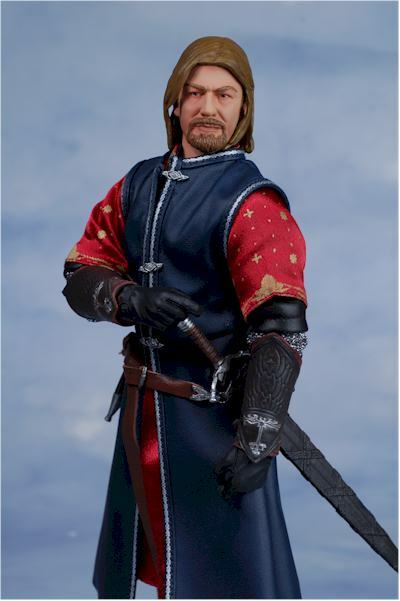 It should be no surprise that Boromir comes in both a Sideshow exclusive version (run size of 1750) and a regular edition (run size of 2000). Also as usual, the exclusive is such because it includes additional accessories, in this case a severed Orc head and the Lothlorien cloak. The exclusive sold out quickly with Sideshow, but the regular edition is still available at the site for $65. The exclusive originally sold for the same price, which was quite a deal considering the extras. I have a few other options listed below for picking up the regular version that may save you a few bucks. Sideshow continues to do a fantastic job with the packaging for both the Star Wars and LOTR licenses. This gate fold box has excellent graphics, and opens to reveal the figure in an attractive format. There's a ton of great text on the inside flaps and back of the box, and the package is completely collector friendly. There's no twisties, no dental floss, nothing tying this guy down. He does have a small plastic ring around his face, which has been wisely added to the newer packages so that the face doesn't hit the cover tray. There's one minor annoyance though. They had to use tape to keep the dagger in place, and this tape will end up sticking to the knife blade. Use some hot water and you should be able to get the residue off without too much trouble though. I also wish they used the magnets with these packages, the way they do with the SW boxes. Instead, they have the velcro closures, and one of mine fell off almost immediately. Still, these are minor nits on otherwise fantastic boxes. Some folks are going to feel I'm being too hard on this sculpt, even with an almost perfect score. Something that you don't see very often happened with this figure - the production figure looks BETTER than the prototype did. Just look at the photo on the box and compare to the head you got. Amazing improvement! This is largely due to making the figure appear a bit younger. 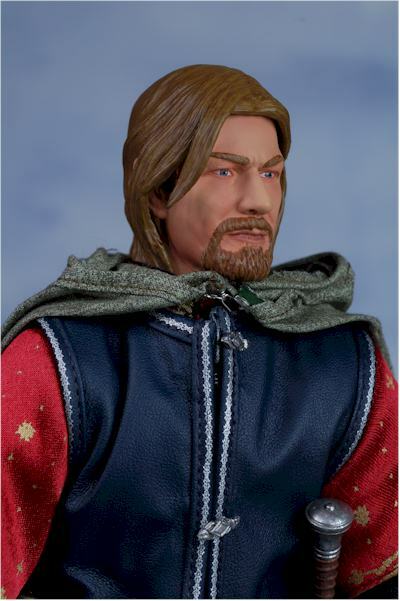 My greatest issue with the original sculpt is that it was more wrinkled and aged that Boromir appeared in the film, with deeper creases along the cheeks and forehead. These have all be greatly reduced, and even the nose got a re-do. It's been thinned out a bit, with less of a rounded end. These changes really enhanced the face sculpt, and if I were merely grading on the likeness of the face (and expression) he would have easily been another half star higher. It's not the likeness this time that causes me any issues. It's the hair. Now, don't get me wrong, this isn't the tootsie roll hair we got with Aragorn. And they are trying to capture a very complicated hair style, unlike Legolas for example. Here, part of his hair is dropping over his forehead, with longer sections hanging in front of his ears. This mussed doo is much more difficult to pull off than something tight to the head, and while they gave it a great try (and it also improved since the prototype), it still falls a bit short. I also wish the hair had the level of detail we've seen in some of their sculpts. The strands aren't as thick and undefined as Aragorn, but they don't have the crisp cut of some other examples. Still, Sideshow made improvements on this figure from prototype to final product, and they have to be given a lot of credit for going the extra mile. One other issue that's plagued some Sideshow figures is the oversized head. I suspect it may have to do with all the layers of clothing, but the head here is perfectly scaled to the fully clothed body. Strip him down far enough, and I suspect it will start looking too big, but when he's fully dressed, it looks spot on. The paint work on the entire figure is excellent, but I'll be focusing on the head and hair here. The work on the accessories and sections of the outfit will be part of those categories. The eyes are clean and neat, with a somber feel to the expression. Thank God there's no lazy eyes or wonky paint work here. The lips are straight and even, with just the right color, avoiding the lip stick appearance. Some have said they are too dark, but I don't think so, especially with them buried inside the van dyke. Speaking of his facial hair, it works much better on him that Aragorn's did, largely because he had more in the film, and they were able to match the thickness and color a little better. He still seems to have a bit more moustache and beard here than he did on screen, but it's closer in appearance than Aragorn. The hair color is a good match to the film (and to the van dyke), but is a bit too even. It's a fine line between not enough detail in the hair and overdoing it, but I think they erred a bit on the side of caution this time. All in all though, there's very little to complain about in this category as well. Sideshow's body doesn't seem to have changed, but I didn't strip this guy down buck nekkid. 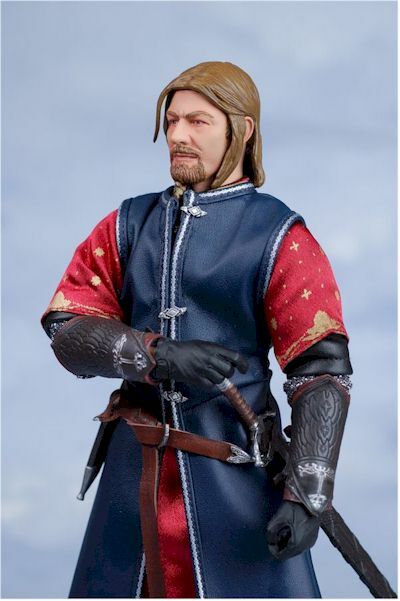 I can say that while it may not have changed, Boromir seems much more posable and natural than some other figures. This is partly due to the longer clothing covering the skinny thighs and pelvis, but the joints are also quite tight and hold positions extremely well. That doesn't mean that I'm stopping my campaign to get them to hang and flow more naturally, but I have less to complain about this time around. I've said it before but I'll keep saying it - the next step in sixth scale body evolution isn't in more joints, it's in getting the current articulation to bend and hang more naturally. Remember, I'm grading the exclusive here, which has the additional Orc head. If you picked up the regular edition, your score may be lower. Boromir starts out with a couple weapons, necessary for defending himself against orcs and annoyed hobbits. He has a very nice sword, made from a sturdy plastic but quite thin. Don't go wild with it though, as it could snap fairly easily. The upside is that it won't wilt, but it could break. The small knife is also quite nicely done, with a wonderful sculpt on the hilt and the same stiff plastic as the sword. Both can be held in the hands, although the knife is a tad small as usual. Both fit in the scabbards well, although it's a little tight. Unlike Aragorn and Legolas, there's no bow, but that's fine, since the bladed weapons are so well done. And besides, Boromir wasn't an arrow kind of guy. Let's talk about those scabbards in a little more detail. The sword scabbard has an intricate sculpt, and the belt attaches to either side with metal hoops. I did have a little trouble with one of these loops, when it came off the scabbard and took some effort to repair. While it might be a bit fragile in general, the belt/scabbards looks fantastic. The knife scabbard is actually held to the belt with two leather loops, and these attach to the scabbard with similar metal loops. The sheild is perhaps the most impressive one I've seen in some time. The double leather strap in back is designed to fit around the chest and shoulders, and can be adjusted as need be. The handle in the center can be held by either hand. The detail sculpt is excellent, with the front surface having the appearance of leather, while the intricate sculpting on the center and edge give the appearance of finely crafted metal. Boromir also has the Horn of Gondor, in it's whole and unbroken condition. Like the shield, the sculpt and paint here are outstanding. With the paint and sculpt, they manage to create the illusion of real metal, leather and even horn. The rope that can be hung around his shoulders is a tad thick, but it's a very minor nit. That's it for the regular version, but these accessories are so well done, they'd easily rank ***1/2 stars on their own. 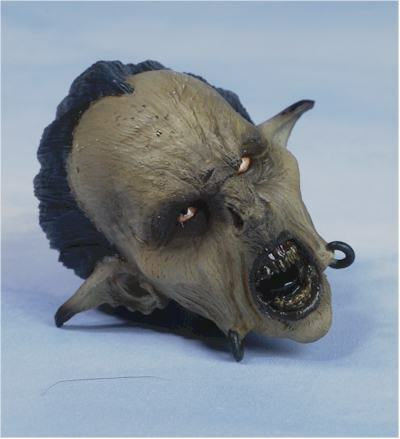 The exclusive adds another terrific item though - the severed head of an Orc. While the final version isn't quite as nice as the prototype, it's still a terrific job. The eyes are rolled back in the head, with a bloody stump for a neck. Blood is splattered lightly on the face as well, and the textured rough skin is very realistic. 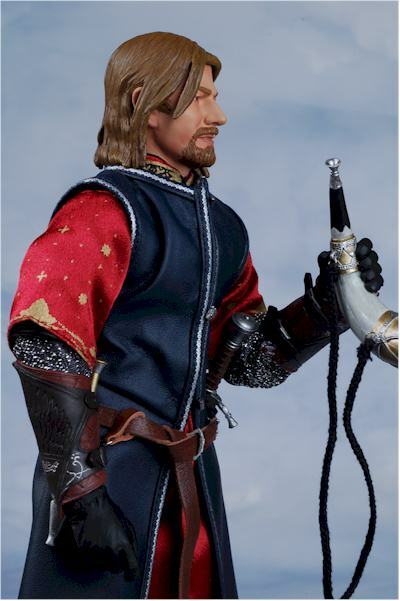 He also has an excellent hair sculpt, with the kind of detail I'd like to see in Boromir's doo. There is a hole in the center of the neck though, which would be handy if you want to mount it on the post, but which takes away from the appearance slightly otherwise. It shows the white plastic up inside, and really needed a touch of paint at least to help hide it. I suspect this hole is there to make the hand painting of the head easier during production, but they needed to cover it up a bit as the final step. Although I'm grading the exclusive with the included cape, I seriously doubt you'll find the regular lacking in this category. The rest of the outfit, sans cape, deserves this same score. Every piece of clothing is well tailored, with an excellent fit and appearance. The material is top quality, with great stitching and construction. Let's start with the pants and shirt. The dark red shirt is almost completely invisible when he's fully dressed, but they included it as part of their attention to detail. The one section you will see is the chain mail sleeves, made from a material that pulls off the appearance quite well. The black pants are a little baggy - you know that Sideshow pelvis is a bit skinny - but you won't need to pad it since it's completely unseen when he's fully dressed. The boots are the best in the series so far, and there's even 'wear' added to the top of the foot, making them appear aged. The also allow him to stand in even deep stances, working with the articulation rather than against it. Over the shirt is a red tunic, complete with beautiful gold patterns on the sleeves, and even gold buttons running down the front. 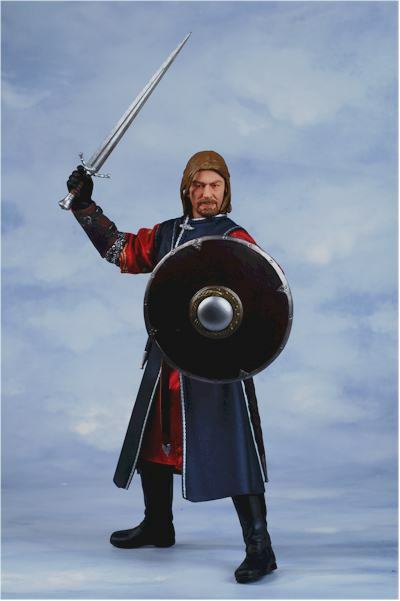 Over this tunic is the blue surcoat with silver edges, made from a thin pleather. This surcoat is thinner than Aragorn's coat, and is much better in fit and appearance. All the clothing uses hooks for closures, and these are very small and very well hidden. On both arms are vambraces, leather armor for the forearms. These fit tightly over the layers of clothing, and are made from a sturdy plastic with nicely sculpted details. Finally for the regular version, there's the belt I mentioned earlier. The buckle and end are both made from solid, sturdy sculpted plastic, and the belt fits him well. It will take a little work to get it just right, but once you do, it will look terrific. The exclusive also comes with a Lothlorien Elven cloak. This cloak is identical to the one we got with Legolas, and includes the wire in the hood to allow for greater posability and the rather rinky dink leaf broach. It's a nice addition, but not something I suspect I'll end up using with the figure on the shelf. That's a lot of clothing and a lot of layers. Had they not worked to use the thinnest materials possible, still making them as high of quality as possible, it would have ended up appearing too bulky and out of scale. Instead, it's one of the most impressive outfits I've seen in a long time on a sixth scale figure. There is one issue that some folks may have. He looks extremely clean. They skipped the weathering this time, after getting so much grief over the Aragorn weathering. While he looks like he's wearing his Easter outfit, I think it was a smart move. The bright colors really add some pop to the display on the shelf, and lend a regal air to the character that he deserves. 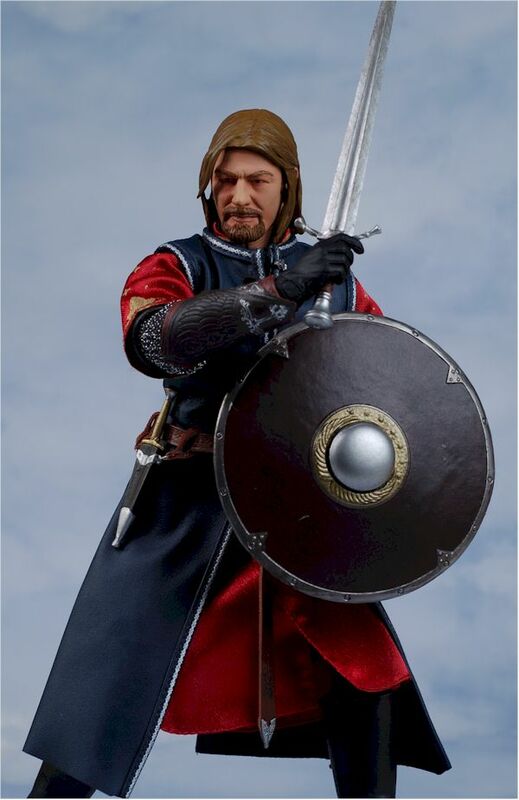 Aragorn may be the heir to the throne, but Boromir looks the part. While these aren't designed to be kids toys, they haven't forgotten that they are based on the concept of action figures. 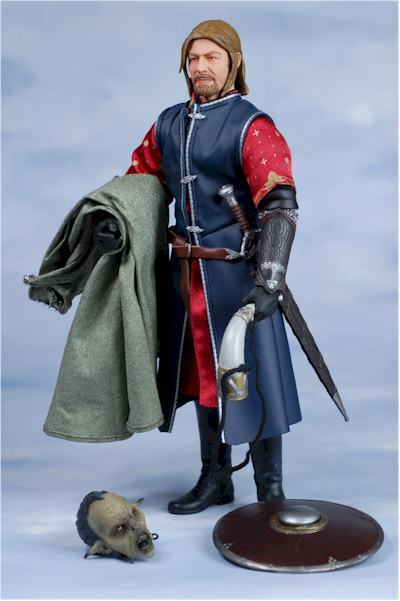 Boromir can be posed in many ways, and the accessories are generally sturdy. I wouldn't be turning over the sword and dagger to an 8 year old to play with, but older kids that love the films will enjoy these figures. And if you're married to a big kid who just happens to love the movies and books, then you could definitely do worse when picking out a gift. If I were grading the regular version, without the cloak and without the Orc, this score would drop another half star. While $65 for the regular is about average, once you through in the couple extra accessories you get a better than average value. This is definitely one figure where picking up the exclusive version really does make a difference. 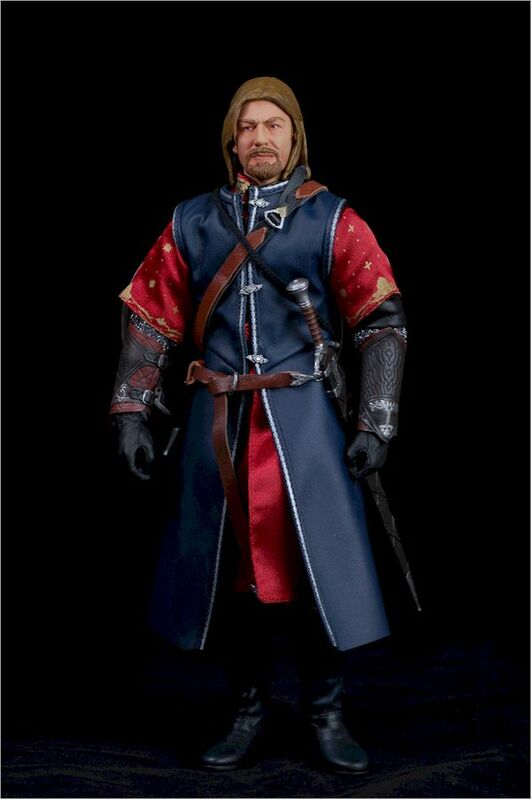 At this point, we have three figures in the Sideshow Lord of the Rings line: Aragorn, Legolas and Boromir. Aragorn was decent, but had enough issues to be concerning. Legolas was a clear improvement, but I think even I ended up being a bit too generous on the head sculpt. 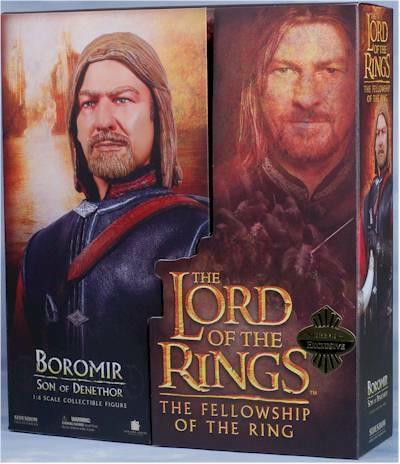 Now Boromir steps up to take his place as the best of the line so far. With this kind of continual improvement, Faramir should be fantastic. I do hope we see some additional characters though, somebody other than the stars of the Men of Middle Earth pin up calendar. While hobbits would be nice, I'd settle for Gimli, Saruman or Gandalf. Hey, I'd even settle for an Orc at this point. There have been no additional announcements for this line after Faramir yet, which is making some of the fans a bit nervous. Let's hope we see some announcement soon! - Dark Shadow has him at the great price of $55.25. - Fireside Collectibles also comes in at $55.25. - Amazing Toyz has them at $55.25 too. - And let's not forget CornerStoreComics, who also have him at $55.25. - Dark Figures has him available at $60. - For the U.K. readers, Forbidden Planet has him at 36 pounds. - from Sideshow, there's the 12" Aragorn, 12" Legolas, and quarter scale Premium Format Lurtz. - and now from Gentle Giant, we have the Strider and Ringwraith mini-busts, the first in their on going series.